I just returned yesterday from a week in Athens for an academic conference. There seemed to be a big socio-economic divide in voting intentions. The unemployed and menial workers were definite No votes. The Yes votes were physicians and a few academics. Personally I think they should bag the euro and go back to the drachma. Brandon: how long do you think it will be before Putin is making deals in Athens? Might be nice to have a friend in the EU when sanctions come up again. Port privileges for the Russian navy would be very conveniently located as well. Jacques has a good, thoughtful response (“Leaving the Euro zone does not require leaving the European Union”) that I wholeheartedly agree with (and that I’ve blogged about here and here), and it appears Dr Amburgey is in agreement with us (though does he think Greece should stay in the EU?). Contra Dr Foldvary, I do not think there is any need for Greece to leave the EU. If anything, the EU should be adding more states, though not expanding its geographic space. Regarding Russia, I simply don’t know. Russia – along with Turkey, Iran, and China – is a society that is very hard to understand let alone predict (I would add India/Pakistan to this list, but the states of the Indian subcontinent are traditional post-colonial states and are therefore much easier to predict; the other four were never conquered or carved up by imperial cartographers). The whole Crimea debacle still has me smarting. Nevertheless I’ll add my thoughts to the conversation. Greece fears Russia, which is why Athens has remained in NATO for so long. Most Greeks – even the ‘No’ voters in this recent referendum – don’t want to leave the EU; Greeks overwhelmingly want to be a part of ‘Europe’. There are couple of minor reasons, too, though I don’t know how minor they are. 1) Greece is not Ukraine. 2) Russia’s economy is in shambles. Greeks have a higher standard of living than do Russians. On the flip side, the Greeks are always thinking about the Turks. If an opportunity presents itself (though I cannot think of any arising), Athens may start to edge closer to Russia (a traditional enemy of Turkey) if it thinks Ankara is getting antsy about its former province. This is pretty extreme, though. Also, Russia’s economy may be in shambles, but it seems like Moscow always has plenty of money for military expenditures, and rent stemming from a Russian port in the Mediterranean Sea might be too tasty to resist for a country saddled with so much debt. At this point I don’t think Greece has much clout in European politics, so I don’t see Moscow viewing Athens as a reliable friend in Brussels. I still think this is all a part of Russia’s symbolic strategy against the West. As you mention, the referendum is not legally binding and nobody aside from Moscow has recognized it. What I think the best option available to the West would be to go ahead and recognize the independence of regions within Russia’s “official” borders (the territories you mentioned, for example). To back this up, simply make a mockery of the whole process going on in Crimea. Have a couple of silly press conferences. Then, to add teeth to the recognitions, publicly announce some weapons deals with Georgia and Ukraine. Publicly announce that all Western arms-related bans in the Caucasus are to be repealed. Then point out, in a rueful manner, that Canada and Mexico are under threat from domestic fascists and must be invaded in order to protect the American citizens and lovers of American citizens in those two countries. Mocking Russia’s current moves in Crimea will have a much greater impact on policy decisions and public opinion than economic sanctions (which will only make things much, much worse). Sanctions are a prelude to war. There is also the issue of secession and political oppression to think about. As it stands, the Crimeans should be able to vote their way out of a political union with Kiev. So, too, should Dagestanis, Chechens, Karelians, etc., be able to vote their way out of a political union with Moscow. The fact that only guns have so far been able to secure a vote in favor of public opinion (Crimean secession from Ukraine) suggests that liberalism has yet to reach enough minds and institutions to have the positive impact that I think it could have on the world. I also don’t buy the argument, made by some, about the fact that at least one of these oppressed post-socialist, post-Soviet regions was able to secede from a political center it deemed oppressive and should therefore be viewed in a positive light, even if it was Moscow’s guns which brought about the change. To me this line of reasoning is akin to arguing that the US invasion of Iraq was a cautious positive for the world, even though half a million people died due to the invasion, because there is now one less dictator in the world. Secession needs to be viewed as a legitimate political option for peoples and this recognition needs to be incorporated into the legal systems of liberal societies if we want to avoid more conflicts like the one between Russia and Ukraine. The world is devolving politically, which means secessionist tendencies will increase, and if there is no political or legal mechanism (much less intellectual recognition) for dealing with these aspirations then be prepared for more problems in the post-colonial world (see this and this), but not so much in the West (see this and this). Liberals, of course, have been at the forefront of the secession debate since John Locke first brought it up in his 1689 classic Second Treatise of Government. Some good historical analysis here, but I’m not so sure about the conclusion. I certainly support a right for regions to secede, but not all EU member states recognise such a right. Spain is the obvious example, since while it gives a high degree of autonomy to regions, including enhanced autonomy for Catalonia and the Basque country, it does not recognise any right to secede except through a law passed by the Cortes (parliament of Spain), which is extremely adverse to allowing any procedure for secession. Greece has been extremely adverse to secession by Kosovo from Serbia, and does not recognise Kosovo, on the basis that a majority vote within a region-aspirant nation is not enough to justify secession under international law, if opposed by the nation from which the secession is taking place. I suspect there are some other countries with similar barriers to secession. They’d do well to recognise that right, but the EU can’t force this kind of change on existing member states since unanimous consent would be required for the necessary treaty changes, and even without that barrier, the idea of the EU forcing countries to accept a right to secede and then define when and how that right to secede, which could create conflict with counties like the UK which do recognise the possibility of secession by referendum within the relevant region-aspirant nation, as in the current Scottish vote. The time might come in the future when all EU countries might recognise a right to secede and then recognising that right could be a requirement for membership. However, it is not Putin’s Russia that would be concerned. Recent events in Ukraine show Putin’s agents fomenting violent secessionism in Crimea etc and a rigged referendum in Crimea. Of course Putin’s meddling is not the same a secessionism exercised peacefully and through fair voting, but such differences are likely to be overlooked by many in light of the still unfinished Ukraine crisis. My response can be found here. Longtime reader A. Herkenhoff chimes in as well. [Editor’s note: the following is a short essay by Payam Ghorbanian. Payam was born in Tehran, Iran. He got his bachelor of science in Engineering from Zanjan University in Zanjan, Iran. He has been participating in liberal political activities and he was involved with some think tanks in Iran. He is doing research in the field of international relations and Iran’s foreign policy as an independent activist. He is now living in San Jose, California. One of the worst Persian attitudes, which really makes me upset, is that we really like make everyone feel pleased and at the same time we are trying to make our friends, our families member, and finally ourselves feel proud. This seems to be just wasting of time and even sometime more than wasting. It really holds us back from being flexible and being more focused just on our life. The fatal mistake in terms of power games is taking one step back because of pacifying your enemies. I remember these fatal mistakes occurred during Mr. Khatami presidency (1997 – 2005) and it seems that it is going to happen again. During that time reformists tried to please everyone. Liberals, communists, and extremists could fit in themselves in what they portrayed for future of Iran. The goal of “let’s get together” is just useful for the specific action and in a limited time not for unstable country like Iran. We are not taking the issues for the country like Switzerland. In fact, you cannot just chant when your enemies are ready to die for their sinister goals. Mr. Rohani and his consultants during last month just tried to convince the middle class people that they are so preoccupied about what he has promised during his presidency campaign. Rohani also said: “… I have never forgotten what I had said to my people but you should understand; there would be a prolonged way with unforeseen obstacles that we have to pass it through together…”. However, this is not the way that people of Iran are thinking and believing at this time. The fact is that the imprisonment of leaders of green movement has been lasting up until now and there are still so many political prisoners in prison. In fact the pace of executions is still through the roof and opposition can be called easily sedition. All of these issues just mean that the new government and the new goals of basis changes have not been acknowledged by the powerful organizations that live in the parallel world of responsibility. These groups of extremists can take any action whenever they want without taking any obligation and no one has the authority to prosecute them. They are not supposed to be questioned and on the other hand, no one knows who they really are. I call them “Undercover Occupants” which means obviously they are connected to somewhere but where exactly this department of power is remains the question that no one has the answer of. There are always lots of rumors which they are the members of Basij militia or some religious departments but it is still in denial. Four years age, in 2008, during the rebellious days of Tehran, these undercover occupants attacked The University of Tehran. So many students were injured and finally the supreme leader commanded the “Supreme National Security Council” to get involved and back them off. They also tried to condemn in public during the chairman of Islamic parliament (Ali Larijani) speech. In fact Ali Larijani is so close to the supreme leader! These undercover occupants were also involved in occupation of the embassy of the Great Britain in Tehran, which caused the big collapse of foreign policy for Iran. I can count thousands of these nonsense and non-logical movements which sometimes caused the supreme leader’s reactions. Occupants recently confronted president Rohani and actually went up against him after he got back home from New York. They criticized him that he was not authorized to talk to president Obama and that he put country down. Obviously President Rohani has decided to discard his goals about his domestic policy for a while until the nuclear issue and sanctions are still on the table. He really thinks being triumphant in talks between Iran and 5+1 can help him precede his domestic policy inside the country. However and on the flip side, the extremist members of the Islamic Parliaments and some members of the Revolutionary Guard put their total vigor to not let him proceed. The upcoming parliament’s election and economical situations will be so important for the players of this poker table. The supreme leader has not taken a side yet which is so meaningful in Islamic Republic of Iran. As I have heard, during this year the economic situations in Iran are getting better. The hope of better future has still long way to be cultivated but people are still hopeful to upcoming talks. These are all proofs that show us having better relations with powerful countries will help you to have better chances. We are not living in the separate worlds and our planet is so combined that being isolated just deprives you not anyone else. Last month, foreign ministers of European countries and especially Mrs. Ashton had several meetings with foreign minister Zarif. Mrs. Ashton recently went to Iran and talked in person with Mr. Rohani. She had also a meeting with some political prisoners and their family members, which dragged the undercover occupants to the front of the Austria Embassy where that meeting had occurred. They were claiming who let her to talk to the “Fitna” followers, the name which they have been using for naming oppositions in Iran during election in 2008. After while the extremists in parliaments called up Mr. Zarif and the Minister of Intelligence and Security. They asked the same question that undercover occupants had asked before. One of the recent issues which might partially help the extremists inside Iran for improving their positions is the issue of Ukraine. The commander of IAF (Iranian Armed Forces), Hassan Firuzabadi, clearly shows respect to what Russia has done inside the Ukraine and Crimea. He also said the vandals just pulled off the coup and it was not the process of legitimate transactional and transformational leadership. Now they believe the most newest powerful country just pops up and subsequently the consolidation of 5+1 is fragile right now so there is no need for retreating at this time which I think it could be somehow the fact that the United States and the NATO don’t want to respond literally to the Russia and president Putin in order to force them back. Finally the internal battle inside Iran would go on and this battle would demonstrate the balance of political groups, the supreme leader and the Revolutionary guard. It could be one of the effective occurrence for Iranians. Look at the Kaliningrad Oblast. It used to be Prussian Koenisberg, an important detail: Many Germans still feel for it, like Russians for Crimea. This is one part of Europe toward which the Germans might loose a little of their current prudent cool and cooperate. Find Kaliningrad on the map. It’s a small Russian exclave on the Baltic. It’s entirely sandwiched between two NATO members that are also members of the European Union, Lithuania and Poland. It must have some military value because it’s the headquarter of the Russian Baltic Fleet. Kaliningrad has no direct land links to the rest of Russia. Sea links are along the shores of unfriendly to very unfriendly countries. I don’t see why it would be difficult to apply an on-and-off siege to that territory. I don’t mean that the West or the US should actually attempt to starve its about one million people. I am thinking cutting off the water intermittently, for example. 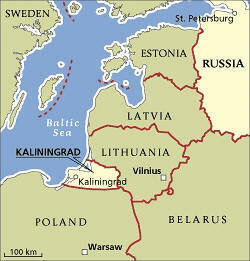 Perhaps a few US warships could cruise off Kaliningrad with all guns carefully covered. We should be able to cause enough unpleasantness there to stampede part of the civilian population. We might just let Russian sailors there lead lonely and even more drunken lives than they do now. After the gobbling up of Crimea, making it difficult for Russia to staff its isolated western outpost would be a worthwhile goal. Even giving high Kremlin officials a few bad nights of sleep would be better than nothing. Letting bullies get away with anything is always a bad idea. It’s like asking for more bullying in the future. I don’t know why no one is talking about it, not the Obama administration, not the Republican opposition, not the supine press. Are we that pathetic or merely ignorant? The historically great city-state of Venice is contemplating independence from Italy. “Over two million residents,” nearly half of the total population, “of the Veneto region took part in the week-long survey, with 89 percent voting in favour of independence from Italy.” The Indipendenza Veneta party believes that the centralized Italian government is unable “to stamp out corruption, protect its citizens from a damaging recession and plug waste in the poorer south.” Venice joins Catalonia and, for better or worse, Crimea this year in considering breaking away from it’s central government. Catalonia’s request for an independence referendum denied by the Spanish prime minister while we all know how long Crimean independence lasted. All is not lost however. Russia (continues) to occupy the Crimea, while America and Europe (continue) to demand the withdrawal of Russian forces from the province. Putin, calculating that the West lacks the stomach for direct confrontation, refuses. Hysteria in the media and in government publications, which are ultimately the same thing, rises. A lack of direct conflict between Russian and Ukrainian forces, however, lends little credence to the mass panic broadcast over Western media. The furor dies down in time. Russian presence becomes normalized in the Crimea. Or, the interim government, bolstered by further illicit monetary aid from America, pulls a Georgian move and attacks the Russian forces stationed in Crimea. Russian forces will quickly rout the Ukrainians sent against them, and most likely march towards Kiev – whether they take it or not will depend on the response of the international community, as with Georgia. Regardless of who instigated the violence, the Western media will blame Russia, and the war drums will grow louder. UN sanctions are unlikely, since Russia is a permanent member of the Security Council, but some form of economic punishment will occur. Russia will draw closer to China, Iran, and Syria. The status quo ante will be upended in no one’s favor: Ukraine will be in shambles, Russia and America will be set at odds. Regardless of the above two scenarios, meanwhile, the Ukrainian economy is in free fall, and the IMF offers the dual poisons of austerity and liberalization to the interim government. Facing an intransigent Russia and the wolf-faced smile of the West, the interim government accepts the IMF’s offer. Like Russia before it, Ukraine is left even worse for wear by the rapid pace of economic liberalization, and is thus too weak to resist the Russian presence in Crimea. Thus, the West has succeeded in breaking off a chunk of post-Soviet Ukraine and bringing it into its influence, while Russia largely retains what it had beforehand: its Black Sea Fleet in Sevastopol, along with the de facto annexed province of Crimea. It is too early to tell, but perhaps the rest of Russified Ukraine will also join their brothers in Russified Crimea, and the state will break up along linguistic lines. Who can tell what will occur? My money is on Russia, but maybe Obama will come up with some game winning stratagem (don’t snicker!). Does anybody else care to make their predictions? You know where the ‘comments’ sections is!